This is a nuanced argument so please try not to jump all over me until you read it all. Then, and only then, should you jump all over me and tell me I'm the dumbest person to talk about energy policy since Warren G. Harding donned a teapot as a hat. Fuel costs are down. 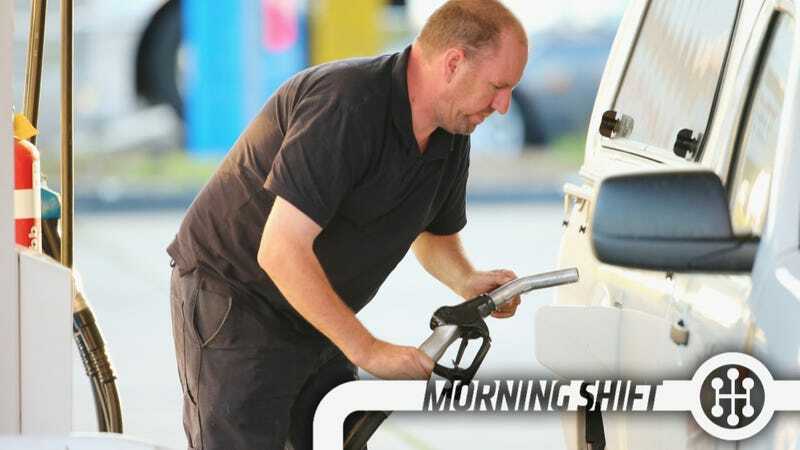 In fact, gasoline is at its lowest price in almost four years because of a variety of factors that are, basically, not that important to care about, but something as plausible as nuclear talks with Iran breaking down could cause them to suddenly rise again. This is leading to people having more money in their pocket come Christmas, which is good. It's also convincing them to buy more SUVs instead of small cars, which is sort of mixed. If you make cars then you're doing ok, but I don't know if it's great for everyone else. There's the environmental factor, with more people deciding to drive when they don't need and buying cars that are less efficient than alternatives — although because new SUVS and trucks are so much more efficient than their predecessors that the impact will be minimized. There's also some concern for what happens when the price of gas goes back up. Suddenly, people will be left with SUVs that, while better, are still not as fuel efficient as alternatives. Consumers are extremely short-sighted when it comes to buying cars. New car plants are also more flexible, so it's not like they'll suddenly be left with a glut of unsold Dodge Durangos as happened in 2008. Sure, the number of selling days for these vehicles will rise, but it won't be disastrous. What actually bothers me here is that we're missing the best chance in a while to raise the gas tax, which is something we desperately need to do. All of our highways are funded by a gas tax and, while cars get more efficient (or electric), the amount of money in the pot to fix roads goes down, even as we have more cars on the road. More cars + less revenue = disaster. And sadly, not the kind of disaster that can bother us into action, like a hurricane or a flood. It's the sort of slow-moving disaster that our current political system is sadly incapable of dealing with at the moment. You may think it's heresy for a car blog to want higher gas taxes, but it's the only way to get better roads and the alternative is arguably worse. Oregon is testing a mileage-based gas tax that most people called VMT for Vehicle Miles Traveled. Critics have voiced privacy concerns over the government tracking drivers&apos; movements. This is a consumption-based tax that charges you based on the miles you drive. While this is actually a fairer and more equitable way to charge people it involves GPS tracking and is, as you might imagine, not particularly popular. It's probably an inevitability, but I think it would have been better if we'd have just upped the taxes now while gas is cheap and people wouldn't have noticed. Ok, flame away. The new F-150 has made a show of lowering consumption with lower weight, but RAM thinks there's more than one way to skin a cat. "(Aluminum) will lower their weight by up to 700 pounds and it will put them roughly 300 pounds less than us. They were the heaviest truck in the market place, so they had to do some things to get down," Hegbloom said today at Chrysler's headquarters in Auburn Hills. "Among all of the factors, it is a very small piece of the equation." Hegbloom said Chrysler decided to offer the Ram 1500 with a diesel engine earlier this year because customers had been clamoring for a half-ton pickup that offers the torque and fuel economy of the diesel. The order, by the National Highway Traffic Safety Administration, demanded that Takata turn over records regarding the production, testing and subsequent concerns raised internally and by automakers over the airbags, as well as communications between the company and automakers about defect concerns. Details of litigation against Takata dating to January 2000 were also requested, as were facts related to Takata’s supply chain management and quality control. Agency Tells Automakers to Speed Up Airbag FixesOCT. 29, 2014 The order came nearly five years after the agency asked Honda and Takata for more information about rupturing airbags after a second recall. But that effort ended after six months, with the agency satisfied that there was “insufficient information” that the companies had not acted in a timely manner. While Toyota said they'd disable defective airbags in vehicles, no such luck for GM though as they really can't afford people dying in their vehicles. NHTSA demands answers from the parts maker. GM spokesman Alan Adler said Thursday the Detroit automaker has parts on hand to fix about 17,000 Pontiac Vibes that Toyota produced for GM. If GM doesn’t have the parts in stock, it will give free loaners to owners, Adler said. GM in June recalled 69,000 models of 2003-05 Pontiac Vibes and 2005 Saab 9-2X. Adler said urgent repairs apply to 17,000 Vibes in high-humidity areas identified by Toyota last week. That's actually a better deal than what you're getting out of Toyota so, good news for people who own Pontiac Vibes... which is a group of people who probably haven't had good news in a long time. The changing of the guard at an automaker can be a troubling time, as we saw when Alan Mulally went full will-he/won't-he with Microsoft earlier this year. Or look at Nissan, who is having to replace execs like GT-Rs replace transmissions because no one knows when Ghosn is stepping down as emperor. And what about Ze Germans? Zetsche said it was generally unwise to speculate in public about who would become the next chief executive, because premature exposure may prove disruptive to a smooth succession process. "If somebody were to emerge into the open as crown prince, he would be shot down the next day," Zetsche said, without elaborating further. Daimler has a number of internal candidates who have the opportunity to prove themselves as being worthy, Zetsche added somewhat cryptically. Asked whether his replacement had already been born, Volkswagen's Winterkorn said, "He has definitely been born, but I don't know what his name is." The 67-year-old Volkswagen chief, whose contract also runs out in 2016, was also asked whether he has one or several candidates in mind to follow in his footsteps, to which he said, "It would be bad if that were not the case." Ok, here's what's really going on here: A crash team of German scientists are trying to create an elixir that will allow these mean to live forever, ruling the world under their enlightened form of benign totalitarianism. On October 31, 1957, the Japanese car company Toyota establishes its U.S. headquarters in an old Rambler dealership in Hollywood, California. Toyota executives hoped to saturate the American second-car market with their small and relatively inexpensive Toyopet Crown sedans. Toyota Motor Sales, U.S.A. sold its first Toyopet at the beginning of 1958; by the end of the year, it had sold 286 more, along with one behemoth Land Cruiser. Neutral: How Should We Fund Our Roads? Gas tax? VMT? Let them go to hell, mad max style?